In her last book, Dorie Clark addressed career transition: how to evaluate your strengths, and develop and promote your image in order to succeed in your new role. In her new book, she tackles an even more ambitious goal: finding an idea that will set you apart in your field, and then selling it. It may seem impossible to come up with an idea that is revolutionary, or even lucrative, but Clark shows very clearly that it's not. It's easy to forget that trailblazers are often regular people like us, who just happened to think of a particular question or problem in a different way, and the first several chapters of the book are devoted to different ways of approaching this. Each section ends with questions to ask yourself, and one of my favorites in this first part was "What questions do newbies in your field often ask that get shot down or dismissed?" What a great way to identify areas for innovation! Many of the "Ask Yourself" questions were equally as creative and thought-provoking. This is the kind of book in which everything the author suggests, I think "Yes! I want to do that immediately!" I am not, of course, going to do all of the things, much less immediately. I've known Dorie Clark for a long time, and my energy level has never come close to matching hers. But I could do some of the things. Point being, it's all broken down into manageable tasks that you can pick and choose from based on what's right for you. 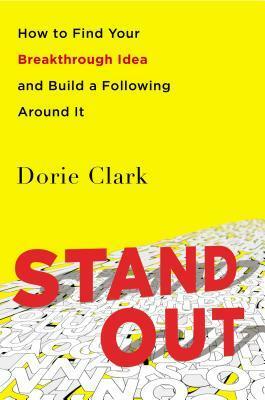 Stand Out contains lots of food for thought, and it's not the sort of book I wanted to plow through. I deliberately paced myself so I could think about the many, many ideas as I went along. Thankfully it is appropriate to many fields, and not just those in the for-profit sector. One of Clark's strengths is her varied background, which includes a stint running a non-profit as well as volunteer work on charity boards, so when she writes she doesn't focus totally on for-profit business. I've been thinking a bit about career development and needing a good idea for a project, so I read this at just the right time. I found it inspiring and hopefully now I will be motivated to take some action. Recommended for anyone with a career.